Our ‘Rancho’ was formed in 1983 and inaugurated in 1984 with ‘Agostinho de Silva’ as instructor of the Principal Group and ‘José de Freitas’ as the instructor of the Juvenile and Infantile Group. Our first director was ‘Gilberto Araujo’. Right from the beginning we had a full band behind us lead by ‘Armando Fernandes’ on the accordion and ‘Francisco Marques’ on the violin with ‘Salomé Gonçalves’ and ‘Marlene Castro’ as the lead singers along with other vocals. 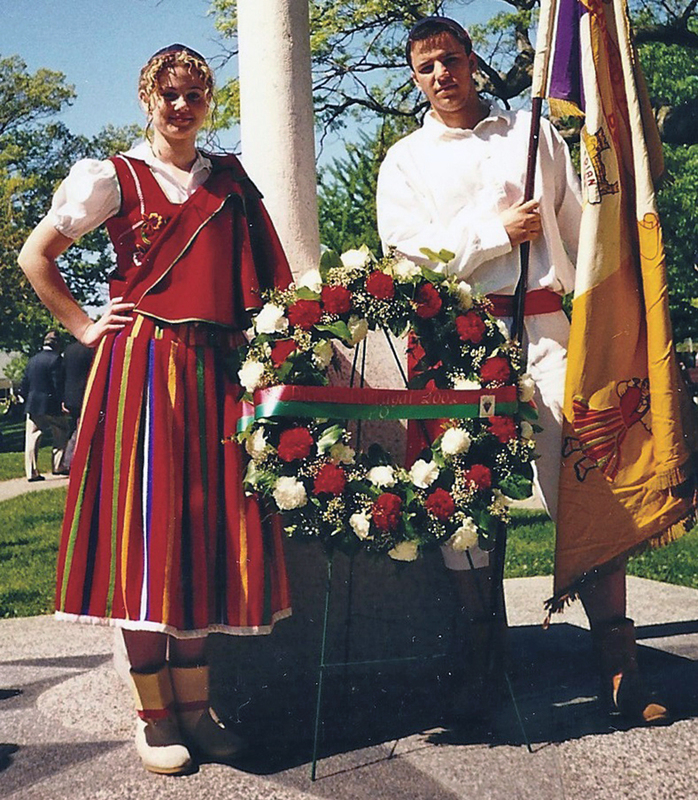 The Juvenile and Infantile Groups were inaugurated in 1986. 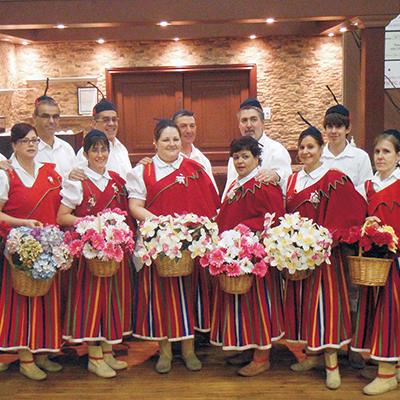 In 2009 our Rancho participated in the annual National and International Folklore Festival in Madeira. 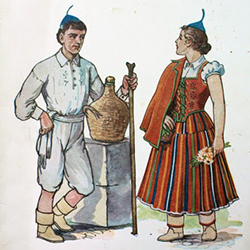 The festival involves some of the regional folklore groups of Madeira, as well as foreign and other national folklore groups. This program is an interexchange program where groups perform in each other’s countries. 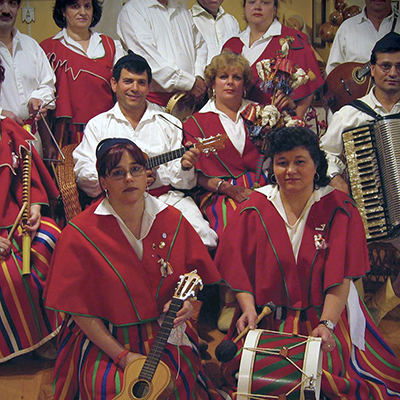 The ‘Rancho Etnográfico da Boa Nova’, has performed in many other countries as well as Toronto and Montreal. Our ‘Rancho’ is looking forward to participating in more interexchange programs. We have performed in New Bedford (US), New Jersey (US), Montreal, Ottawa, Barrie, Kitchener, Hamilton, Brantford, Brampton, London, Fort Erie and Windsor as well as many different cities in Toronto including the opening ceremony of the previously called ‘Sky Dome’ now Rogers Centre. 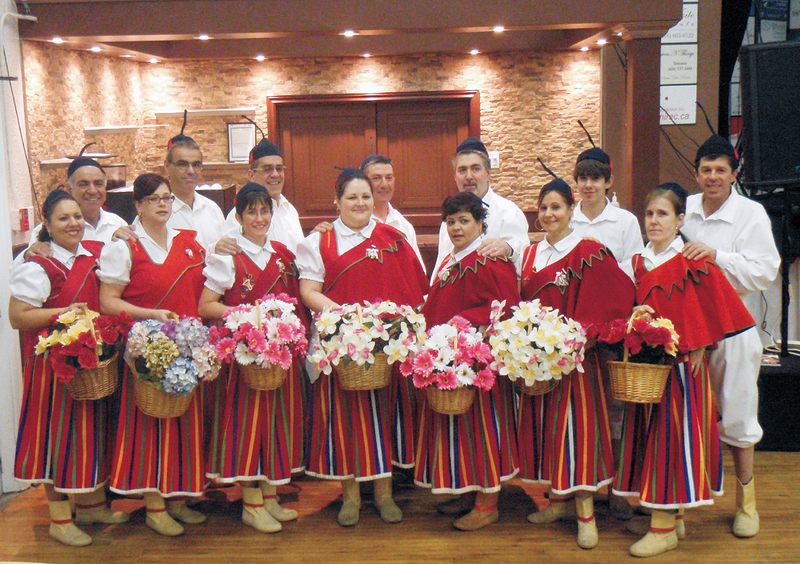 In 2011 a new group was inaugurated called the ‘Floristas da Madeira’. This group was initially designed for a more senior aged group of dancers aged over 25. We are proud to support the Community Folk Art Council of Toronto. Madeiran locals are passionately fond of music. Folklore back home in Madeira, is practiced throughout the year being lived more intensely during the religious festivals, camps or pilgrimages but also in celebrations of certain agricultural tasks, such as harvesting and digging. 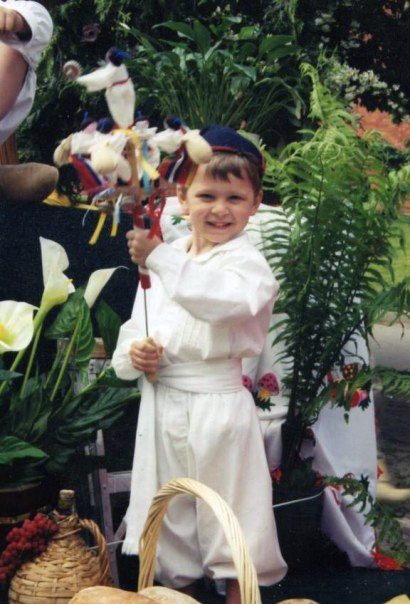 Nowadays, the folk tradition continues with regional folk groups through their dances. Our hallmark Folkloric dance has the name of “O Bailinho da Madeira“, accompanied by voices and music and the well-known challenges, where singers alternately improvise lyrics of social satire nature. Some of the typical dances in our repertoire are “Ponte de Sol”, the “Chamarrita”, the “Bailinho das Camacheiras”, and the crowd pleasing “Rapsódia”. The music and dance of Madeiran folklore describes love, pastoral traditions and the saddest moments in the history of the island. 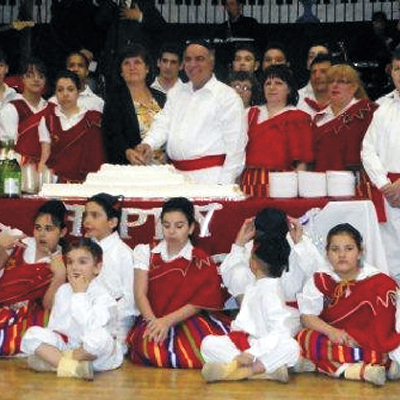 The treading of grapes is symbolized in our dance steps. The detail of our head down represents the time of slavery, symbolizing the slave to the master relationship. The instruments used in Madeiran folklore are predominantly portable stringed instruments such as the machete, the rajão, the braguinha, rebeca, violin ,wire viola, accordion, triangle and our traditional “brinquinho” of local origin. 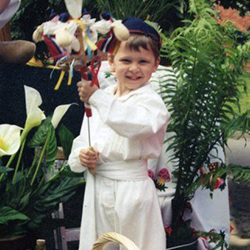 The traditional costume of Madeira is the subject of much speculation with regard to its origin and evolution. It is supposed that it was affected by several national and foreign influences. (Minhota, Moorish, African and Flemish). 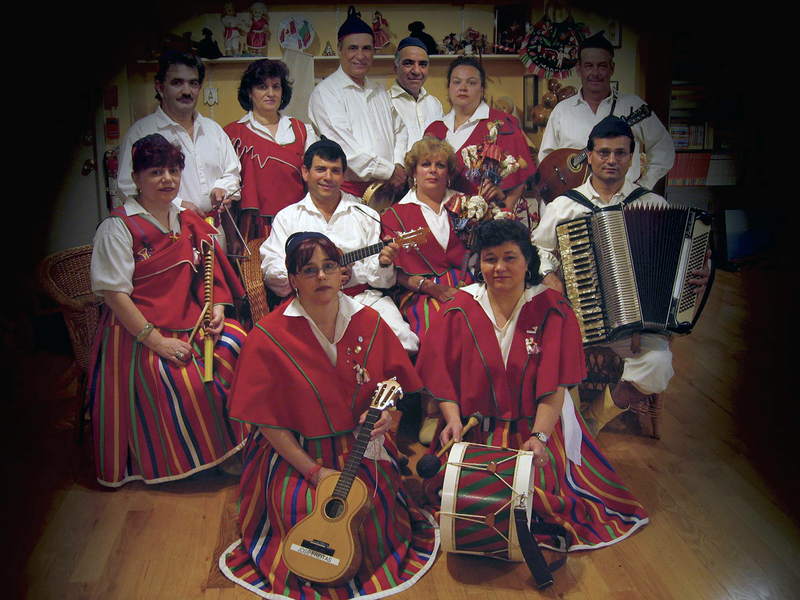 Our Folkloric Group uses the traditional colours from the Village of ‘Camacha’, by far the most well associated to Madeira Internationally. 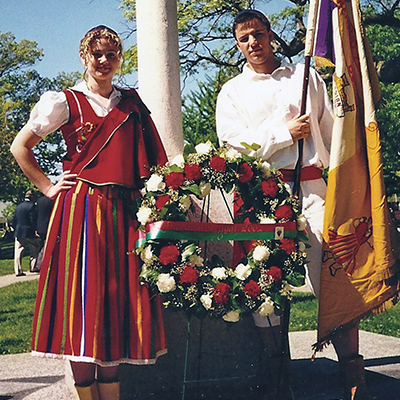 The women’s costume is predominantly red in colour. Consisting of a coloured striped wool skirt, a white blouse under a brocaded red bodice, over lapped with our unique red vest-cover trimmed in green. The male costume is quite simple. It consists of a white linen shorts with a frown on his knee, a simple pleated white shirt. 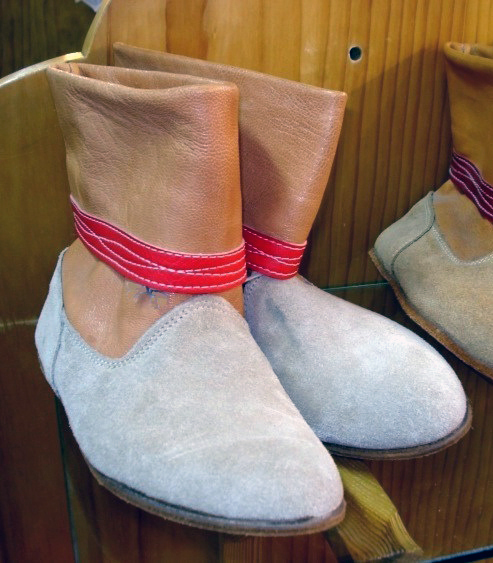 Both men and women where matching boots, called ‘botachas’ or ‘bota-chã’, made of tanned cowhide the top of the boot is turned down most of them have a red ribbon and a blue skullcap(a type of beret), the women’s decorated with a brocaded handkerchief. 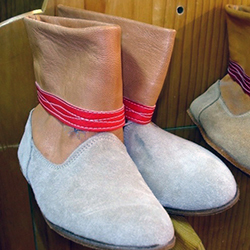 The Portuguese Government donated the first set of costumes as a gift to our Rancho in 1983.